June 20, 2010 by Alphageek in "alphageek bourbon evan williams single barrel"
I am going with some quick hitters here today on the Thoughts. First up is Evan Williams Single Barrel bourbon. This particular batch started in 1994 and ended up mostly being enjoyed by yours truly. Evan Williams strikes me as not the most elegant brand out there. As a result, I was reluctant to try this particular bourbon. That was an epic mistake. Upon trying this bourbon, I found it to be one of the best values out there. You will notice that by the fact that the bottle is empty. 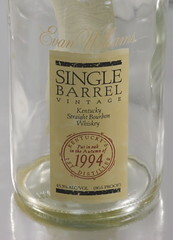 I would not hesitate to recommend this bourbon to anyone who enjoys a good bourbon, especially given the price. So drink up and enjoy! "alphageek bourbon evan williams single barrel"